A company is comprised of a variety of people. With the differences that each employee possesses, unexpected circumstances might come into play that could jeopardize the company’s productivity. The Department of Human Resources issues a Personnel Action Form to help resolve the situation at hand. This form aims to shed light on what possible actions to take in response to the situation. The employer of the company hopes to hire employees that are suited to the company’s needs and can cause no problems to the company. However, it is wishful thinking for one to think that it will be a smooth process. In some situations, an employee might be handed multiple Action Forms if they committed serious actions. A corrective action refers to when the employer issues an action for the employee to work and act on. This type of action aims to correct and resolve the violation that has occurred. Corrective actions from the employed are usually not relayed verbally but through encoded documents. These documents follow the format of Free Action Forms, and is called a Corrective Action Plan. The content of this form contains detailed accounts of the unwanted incident from the employee and the solution formulated by the employer. It is expected of the employee to take the corrective action in order to not be in conflict with the company. A corrective action plan and an Employee Action Form both have the same goal to accomplish. That goal is to have an effective solution to the on-going problem with the employee. When an employee receives the aforementioned form, they first come across the problem, incident that occurred, or the employee’s weaknesses that the company wants to address their concern to. The employer then lists down the individuals who are responsible for the results of the corrective action plan. The solutions to the employee’s issue is relayed in a simple manner. A person is delegated to help in seeing the action plan through and a deadline is set for the action plan to be completed. What Should Be Included in a Corrective Action Plan? The employer, Human Resources manager, or administrative officer can base the format of their action plan with references such as Corrective Action Form Samples , Personnel Action Forms, and Employee Action Forms that are available online. However making one from scratch is not a bad idea to take on. A customized format of a corrective action plan might take time out of the day to create and complete, but the final output is better suited towards the company’s needs. The first section in the corrective action plan is the general information of the employee in question. Their name is listen down as well as their job in the company and the department they are assigned to. What follows is the deficiency they have. The deficiency can be considered as the violation committed by the employee or a problem the employee has that is in conflict with other employees, the employer or with the company in general. There are other employees who are delegated with the responsibility of the outcome from the corrective action plan and with watching over the progress of the employee’s corrective action. The employees in charge of such tasks are indicated in the corrective action plan in order for the employer to know who to look for when progress is looked for. The solution of the employer is labeled as the corrective action. It is written in a specific and straightforward manner but is also simple at the same time. The corrective action is simple enough for the employee to understand and internalize. A deadline is set for the corrective action plan to be executed by the employee in question. It is an achievable deadline which gives the people involved enough time to see positive results. With the details mentioned above, the corrective action plan will be detailed, easily understandable, and effective. There is a possibility that the employee will not follow the corrective action plan so they might go through a more extensive correction action plan than the one before. A corrective action plan revolves around an employee’s misbehavior, or any violations of the company’s rules and regulations. Since an employer would enforce discipline as one of the solutions, employees are given Employee Disciplinary Action Forms if their actions call for discipline to be instilled. If an employee was found to have misbehaved and lagged in terms of productivity in their work, the correction action plan for them to follow will probably be to limit their employee privileges or have them supervised by an employee of a higher rank. Once the employee changes their ways, the employer can say that the corrective action plan was a success. What are Employee Corrective Action Forms? An Employee Corrective Action Form is a type of corrective action plan that is directed to employees working in a company. Employers may create their own customized forms or use a Sample Corrective Action Form as a reference point, or actually use that sample form as their company’s document. 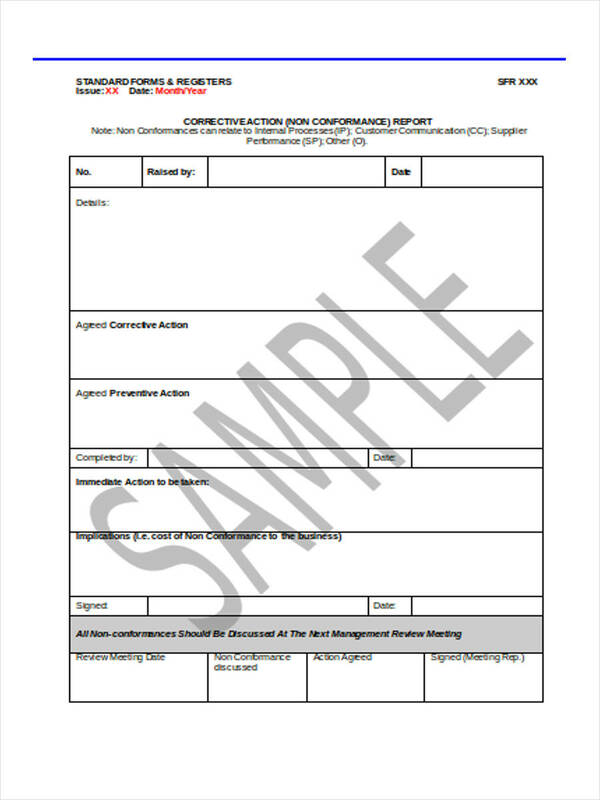 When an employee’s behavior or actions raise concerns within the company, they are given an Employee Correction Action Form. Through the employee corrective action form, the employee will be more aware of the nature of their concerned action and what is the appropriate action in resolving their problem within the company. In order for an corrective action plan to push through successfully, there are two factors for the employer to consider and perfect. These two factors are the format of the Corrective Action Plan, and the administration of the Corrective Action to the employee. Creating the format of the document seems easier in comparison to the method of administration, which can have an impact on how the employee will take on the corrective action. The written document can be created with the use of reference formats such as the Corrective Action Form Template, Action Request Forms, and Employee Action Forms. With this administration method, the formal document is the basis for the starting point in correcting any issues the employees have. The other method, which is verbal involves the employer directly communicating to the employee about the problem at hand. The employer is direct when discussing the problem and exudes professionalism when relaying information that involves what corrective action is to be carried out. The employer reminds the employee of the company’s rules and tells them what they can do to uphold them while going through the process of corrective action. This communication approach can also be used before an employer hands out a Corrective Action Plan Form.